With its sturdy plastic construction supporting up to 300lbs, this folding step stool is great for reaching high shelves with confidence, and is also a great way to give toddlers and little kids independence in the bathroom. The non-slip step stool helps them reach the toilet and wash their hands in the sink, and is lightweight enough for them to move on their own. The step stool even has a built in handle, so it is easy to carry. Unfolding in seconds, the plastic stool has non-slip rubber dots on the step surface, and is ideal for use in busy family bathrooms or shower rooms for both adults and children. Folding back down flat in seconds, the stool can be conveniently stored under the bathroom or kitchen sink. EASY TO USE: This durable folding stool is made for toddlers, children and adults, and is so easy to open and fold, your kids can do it themselves. DURABLE AND STURDY: Made with heavy duty plastic, this folding step stool can hold up to 300 pounds, and will never bend, snap or break. NON-SLIP DESIGN: Viking's non-slip rubber polka dot step surface prevents slips and falls, and the solid, stable stool is ideal for bathrooms or shower rooms. 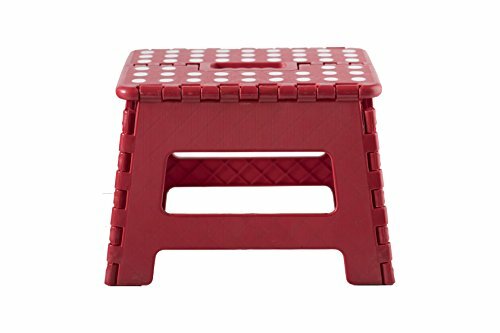 PORTABLE STOOLS: The plastic step stool is lightweight and has a comfortable handle to help you or your child carry it around with ease! COMPACT STORAGE: Viking's folding step stool's collapsible design makes it super space saving - fold and store it under the bathroom sink. If you have any questions about this product by Viking, contact us by completing and submitting the form below. If you are looking for a specif part number, please include it with your message.